From I-70: Take the California Exit and go north. There is a gate between 11th and 10th streets. Most committals take place in the Garden Chapel, which is close to this gate. From Downtown: Take 10th Avenue east. The first gate, just after Lafayette Street, is the one to use when visiting the office. The second gate, at about Leland Street, is the main road into the cemetery. The older areas of the cemetery, including the Civil War section, will be closer to this gate. 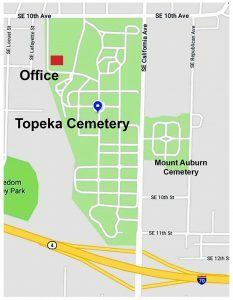 Mount Auburn Cemetery: The city of Topeka owns Mount Auburn Cemetery, but Topeka Cemetery acts as its front door, handling burial services and records. Mount Auburn is on the east side of California Avenue. If you have any trouble finding us, call (785) 233-4132 and we’ll talk you in.